Clean Water Project is a collaborative project between ECO Vietnam Group and HSBC Bank with the support of LIN Center for Community Development. – Location: An Hiep Commune, Ba Tri district, Ben Tre province. – Content: Building 50 reservoirs for 50 poor families in An Hiep Commune. Donating school supplies, bicycles for students in An Hiep 1 primary school and An Hiep 2 primary school. 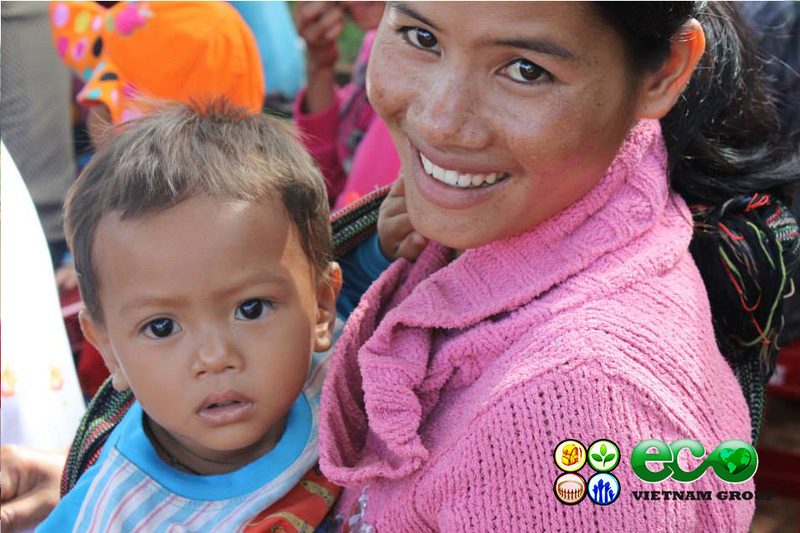 An Hiep is the poorest commune in the 23 communes of Ba Tri district , Ben Tre province . This is an agricultural region , is divided into two areas : land and isles . The population of An Hiep is 121.881 or 2,724 households . On the isle land , because of the lack of clean water , people can not farm that have to employed only with very low wages in the surrounding areas or HCMC . Because life is too difficult, the learning of children are not receiving the necessary attention . One of the urgent issues to be addressed here is clean water . Located near the sea , An Hiep has only two seasons: saltwater and freshwater . Salt water can not be used in crop and livestock production ; whereas freshwater resources also affected by acidity , affect the use in daily life . The only source of clean water is rain water here . So , in the rainy season , people have used the reservoir to reserve water for dry season . However, in many poor families can not afford to build the reservoir, so they have to buy water or use salt water. Therefore, the clean water project brings 50 reservoirs for 50 poor families in the hope that reduced somewhat difficult for the people of this land . 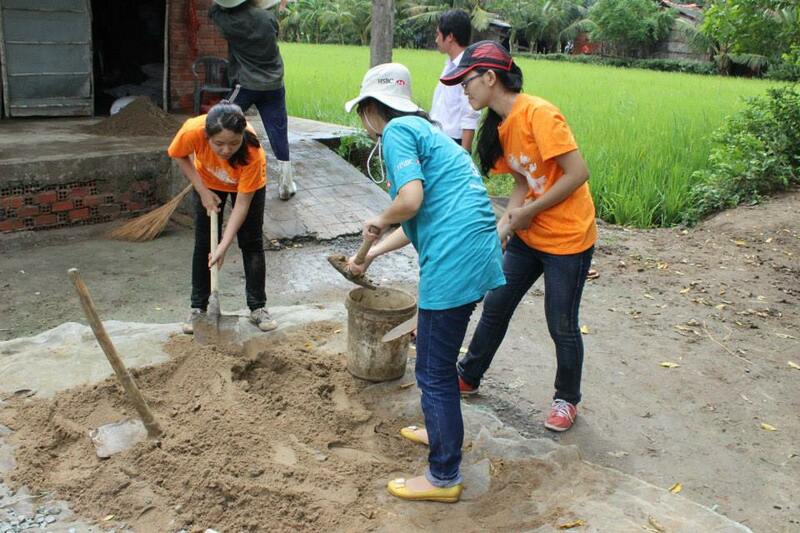 – On 2/8, 16 HSBC staff and 4 volunteers of EVG has built 8 reservoirs for 8 poor households in An Hiep . – The remaining 42 reservoirs assigned to the local to they build and was completed in 9/2013. 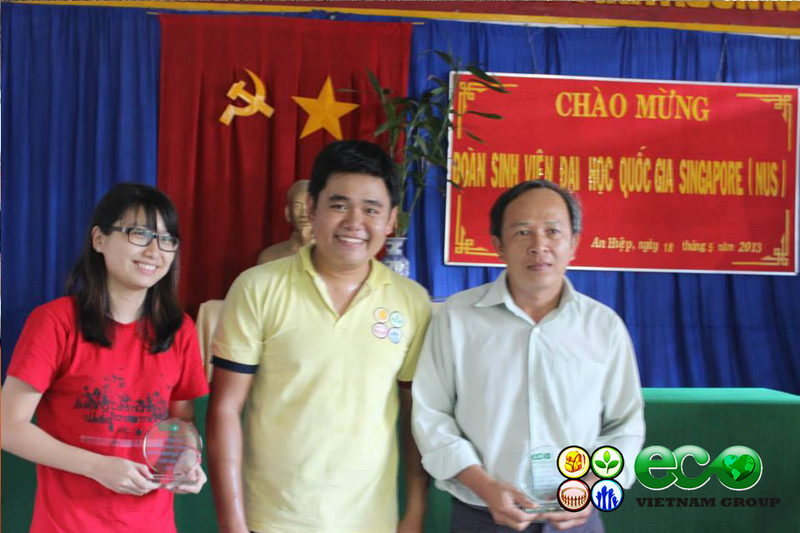 – On 10/02/2013, 5 representatives of ECO Vietnam Group go to the local to test 42 reservoirs . 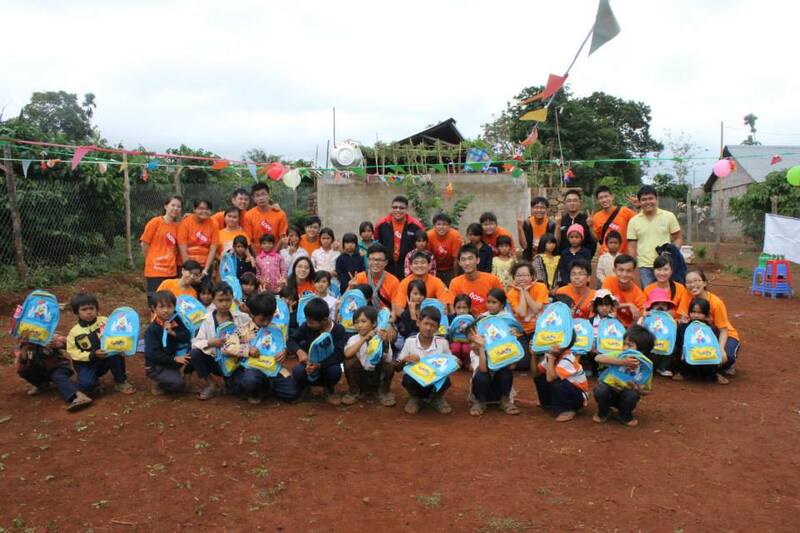 – On 08/03/2013, HSBC staff and volunteers have an exchange day and teach student of An Hiep 1 primary school about hygiene. Late sessions, 160 gifts (by HSBC charge) including pair textbooks were given to 160 school children at An Hiep 1. – In addition, 5 bike (charge by HSBC) has also been given to 5 students with good academic and disadvantaged of An Hiep 2 school. What did you do last sem-break? Have you had a great time? Some of my friends stay at home and relax, others travels around Vietnam and even aboard. My sem-break, on the other hand, was “slightly” different. I went to a voluntary trip in a small village in Dong Thap Province, Vietnam. Coming back from that trip, my heart is filled with love, memories and lessons. Inside me feels a great urge to write down these precious moments to keep the spirit of volunteerism with me forever.I also want to share this experience with you and hopefully, you will see volunteering as worth-trying, mind-widening and simply, fun. It’s all started with a friend of mine who talked me into applying for this trip in a non-government organization – ECO Vietnam Group. I got in. Then, we and 8 others Vietnamese volunteers together with 44 Singaporeans, half are hearing-impaired and the others are students of Nanyang Technological University, participated in a nine-day community project. We built road and restroom, refurnished classroom, taught English to children, organized an exchange session with hearing impaired Vietnamese and challenged ourselves in an exciting race. To be honest with you, it was back-breaking work, but, trust me, it was an amazing experience after all. 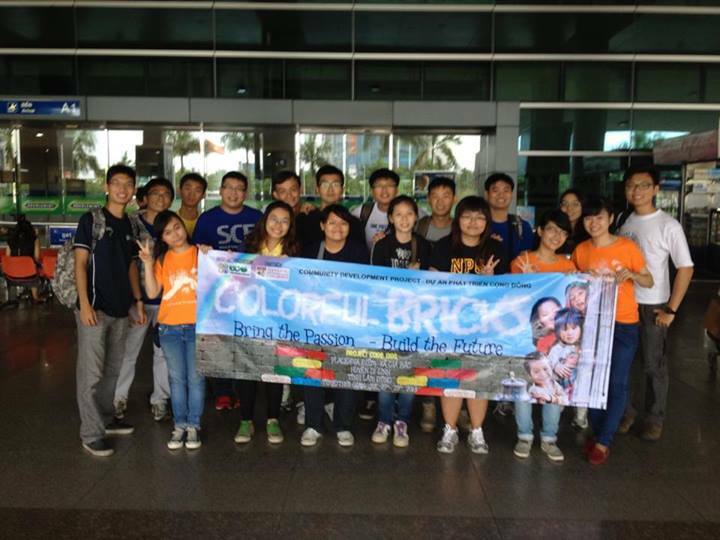 No Boundaries –was the name of the project that our Vietnamese volunteers came up with. I found the name perfectly fit to my case. I joined this trip feeling both anxious and exciting, not to mention curious, too. I’d been desperate to travel for so long but I was too insecure to step out of my comfort zone, leave all the conveniences of the urban world behind and come to a needy place. Actually, I had never even dared to bear the thought that someday I was going to throw myself in a long trip with people from another country, especially when I couldn’t communicate with some of them normally prior to the trip. But, things turned out just fine; since there were no boundaries between us when we all tried our best to reach out. Let me tell you how we reach to each other regardless of our differences. The “daily” routine – those days of living with my friends across countries. We met and soon lived, treated each other like a family, and of course, we did it in rural style. Every morning, we woke up at 6, made bed, washed up and had breakfast together. When the clock stroke seven- thirty, we were divided into 5 teams, got on a boat and travelled to our working “sites”, leaving a “housewives” team at “home”. After 4 hours of working, we rushed back to the hall since none of us could resist the urge to “reunite”. We chatted about what was going on in the morning while enjoying lunch together. OH, WAIT! I need stop right here and dedicate a whole paragraph about the meals. I can say without hesitation that I remember exactly what we ate throughout the trip and it’s definitely not because we ate almost the same thing over and over again! *sarcastic mode* In terms of appétit, our Singaporean friends were unbelievably difficult to please: some were forbidden to eat this (religious reasons, duhh! ), while others were allergic to that! So to avoid the burden of preparing different food for the right people we ended up eating the thing that the majority can eat: pork and eggs, for almost every meal, for 9 days. Yes, you heard me, long live pork and eggs!!! Sorry for the side track, I just want to point out that: when you live with 53 other individuals every small detail can be a big deal. Back to the “daily” routine, in the afternoon, we continued the work from the morning; however, hot weather with the burning sun made everyone much more exhausted. After a long working day, we came home and smelled like, well, smelled like “flower”. So friends, at this point, you’re probably imagining us fighting for the human right to bath first, right? But no, we did everything in order; our Singaporean friends took turn to bath accordingly to a neat system based on who came home first and which work produced most disgusting body odor (true story!). 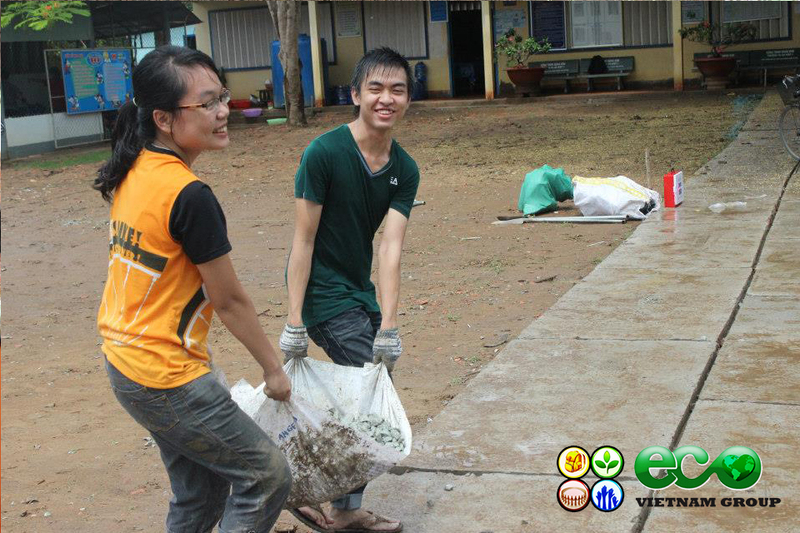 We Vietnamese volunteers decided to show our hospitality by bathing last, a great sacrifice I might say. Bathing is not the only thing we did in the evening, obviously. Every night, after the reflection of the day (for 2 to 4 hours long), we usually did the washing together. Five to six people gathered into a circle with a bunch of washing basins, talked nineteen to the dozen in the dark of night and reluctantly immolated our blood to hundreds of mosquitoes out there. After that, as if we hadn’t seen each other enough, we continued gossiping and never went to bed before 1 AM. The art of building a toilet and its charm. Among the 5 different jobs we did at Dong Thap, the most exciting activity to me was toilet building. It was, of course, the first time in life we built a toilet. We considered ourselves as outstanding architects and artists, not simply workers. We did a serious deal of careful measurement, like how much sand and water were enough to make cement; we placed every single brick carefully on the wall, plastered cement on them slowly and delicately as though we were painting a masterpiece. Looking at the wall growing taller and taller, we felt like we were building a castle. Unlike toilet building, toilet cleaning was much more mundane. After two days in charge of toilet cleaning in our “home”, I got a new nickname – toilet princess– since I was the most professional toilet cleaner and I really pride myself on that! During my shift, I almost stuck to my “flawlessly cleaned” toilets (there was 6 of them) and was willing to “risk” myself to protect my babies. Now, looking back at this moment, I see no difference between me and a loyal guard of a sacred temple. Seriously, only living and working in this situation that you could appreciate the true beauty of a brand new, clean and clear toilet! The works, on one hand were tiring and challenging; not only toilet building but road building, refurnishing classroom, teaching and even house-working as well. However, on the other hand, they were filled with joy, voluntary spirit and pleasant encounters. Indeed, the people I met during those days are gifts of live. The people – the villagers, the children and their warm hearts. The people in Dong Thap were so kind and hospitable. There was a time when we were building the road; a villager living near the place brought us a HUGE bottle of coffee. At first, my Singaporean friends were quite reserved and didn’t dare try it. Only after I had drunk the coffee did they start doing the same. The coffee, since then, ran out in a blink, so she went back to her house and brought us two extra bottles. How kind was that! There was another villager that we dearly called “Thím Năm” ; she is our savior. During work, one of my friends was attacked by a giant worm and the bites were extremely itchy. Thím Năm suddenly appeared from out of nowhere, just liked a fairy, she washed his T-shirt and treated him with her secret remedy. Other villagers at the site also came and helped out. The people in this place will always stay in my mind; they were so kind and nice. They helped us in everything, lent us tools and gave us advices to do our works and treated us like their sons and daughters. Even though lives are difficult with them in the village, some even struggle to make end meets or find food every single day but love and hospitality are what they’ll never lack of. I had a change to visit a poor household in the village and the story we heard brought tears to our eyes, however we also saw hope in the love that the villagers had for each other, they lean on each other to survive. To that, I have to bow down. It is also hard to forget the love the children there gave us. They are not only our students, but also our younger brothers and sisters. During days staying in the village, they often came played with us in where we lived and they followed us everywhere we went. On the day we left Dong Thap, they gave us presents, wrote letters in Vietnamese to our Singaporean friends, drew us pictures, hugged and kissed us. I almost burst into tears. At that moment, I knew I had already left behind bits and pieces of me to those children. After 5 days living and working in the village, we finally had to say goodbye and moved on. Luckily, all of us had had enough time to finish building the toilet, the road – 2km in total, and refurnish the classroom with a beautiful wall mural painted by our Singaporean friends. We said goodbye in a culture night and campfire afterward, which were surprisingly delightful with special performances from all of us – the volunteers and the villagers. At that night, in the warm of the burning camp-fire, we – Vietnamese volunteers, Singaporeans, the hearing impaired friends, the villagers, children and adults somehow became ONE. We communicated in different languages; we couldn’t remember all the names, but, at that moment, when we held hands in a big circle and laughed and danced, I knew that’s the moment I will never forget, there were no boundaries between us. Though we will go our separate ways, the love of that night will follow us anytime, anywhere till the day we come back “home”. Frankly, what I remember most in the village in Dong Thap province, is a dreadful insect. If you ask me about the deepest impression Dong Thap left on me, I will answer without any hesitation: mosquito bites. Oh, yes. Mosquito, a small insect with a long proboscis was the most dreadful enemy we faced. Regardless of how much Soffell (Mosquito Repellent) we applied, we were all terribly bitten. Every little bit of skin that was not covered by clothes was instantly attacked awfully. After coming back to the city, I am still obsessed with that darned creature. On the first night at home, I unconsciously woke up at midnight and started looking for my Soffell. To make things worse, during lunch time at RMIT, me and my friend- also a volunteer in the trip were eating and scratching at the same time, attracting tons of attention. Let’s continue with my journey. Yes, my friends, the village in Dong Thap was only our first destination. After that, we headed to Ho Chi Minh City and had a wonderful, yet challenging time with the hearing impaired Vietnamese from the Deaf Community Organization HCMC (DCOH). Some of you may wonder how I communicated with my hearing impaired friends. The answer is using everything I have got. Besides a little bit of sign language I was prepared, I made the fullest use of my body and facial expression. However, not until the exchange session between Singaporean hearing impaired and DCOH did I realize how enormous our barrier was. Vietnam and Singapore use different sign language hence a message must be communicated from a Singaporean hearing impaired to a NTU student then to me, and then to a teacher in DCOH and finally to a hearing impaired Vietnamese – that were four times of translation in total. Now, I think you may have already imagined how difficult the situation was for us. OK, multiple it by 5, that’s how hard it was when we entered into an ice-breaker game. We signed, waved our hands, wrote our names and did a lot of things to express what we thought and to understand the others. One hour passed quickly. There was absolutely no speaking. No one can possibly imagine that inside such a silent room, we did play, laugh and enjoy a beautiful afternoon together. Mission accomplished! Right after the exchange session with DCOH, it was shopping time, in Ben Thanh market. Now, every time I come across the market, I recalled that night when I took my Singaporean friends there, I decided to pretend to be a foreigner since I was told that vendors there would be really frustrated and irritated when a Vietnamese tried to bargain for foreigners. Truthfully, acting was not the least bit easy. I was more frightened to be “compromised” than actually enjoyed the show. Looking at my nervous face, a Singaporean boy dragged me into his arms, hugged me and told me that everything would be OK. At that moment, I felt like I was his daughter. It was so sweet of him though J. There were times when I was in danger as well (actually, it was nowhere near as dangerous as how we perceived danger). A little adventure that went wrong. On the last days, we moved from HCMC to Can Gio Province, where we played “The Amazing Race” in Vam Sat Eco Park in Can Gio. That was really fun even though my team didn’t win. We all came out covered in sweet and flour. Anyway, after the race, I and a volunteer came back to the forest in the Eco Park at twilight to collect things. The two of us had to carry two chairs, two 15-litter water bottles (empty but enormous) and two big heavy bags of materials for the Amazing Race. To make things more difficult, the road leading to the camping area was nearly impassable and night fell so quickly. We had neither a flash light nor a mobile phone on us. We were desperately groping in the darkness, trying to find the entrance but instead, we penetrated deeper into the forest. We mistakenly got on a rope bridge once and walked into dead-ends twice. Luckily, my life hadn’t ended there yet (I thought I would be rotten in that forest), we managed to find the right way out and met two other volunteers who were looking for us at the forest entrance. Almost bursting into tears, I ran to them like a little duck that had finally found its parents after a long day lost in the forest. There are still so many things in my journey that I want to tell you, but it will be a never ending conversation. And this blog is already ridiculously long, so please stick with me for the last story I want to share, won’t you? This is the Ferry Story. It was the last day of the project when the storm hit us during our ferry back to HCMC. How fierce and intense the storm was! We, 54 people, half hearing impaired, were almost knocked overboard with the catastrophic wind. The ferry was so tiny in front of the cruel and deadly storm in the middle of the river. Somewhere echoed a scream ‘Die, we are gonna die!’ – It was not close a deadly situation but could give several panic attacks apparently. Right after the ferry reached the harbor; we ran off quickly and led our Singaporean friends to a safe place. It was chaotic and nerve wracking as the storm kept on raging, people running and yelling. However, no one was harmed, only soaking wet and frozen; we stood closely to each other while it rained like cats and dogs outside. This is not the way we want to say goodbye to our Singaporean friends at all, but, well, until the moment we sent them off to the airport we were as wet as a fish and our teeth were still chattering because of the cold. What a memory! Time flied so fast. I returned to my normal life without my big family, feeling sad rather than relieved. Thank God for bringing us together in this project, to let me know how volunteering spirit can bridge all the differences and how deep relationship can be built up only in 9 days. ‘When will we see each other again?’ I don’t have the answer for this question but I know once I still keep my enthusiasm for travel to do voluntary work, high chance I will meet those sisters and brothers again. To my friends, Vietnamese and Singaporean, the villagers and the children, I own you an enormous thank you for being with me throughout this journey, for teaching me lessons that I couldn’t find elsewhere. I will always cherish our time together – those summer days we lived and worked for the same purpose: serving the community and learning to be our better selves. This is the end of, simply said, my journey. I hope you enjoy reading this as much as I enjoyed writing it. If this story can inspired even one person to pursuit voluntary work it has paid off. About me, until next time we meet, might be I’ve just been back from some voluntary works. My story of voluntary life has just begun. Definitely! – Built 1 ECO Toiet. 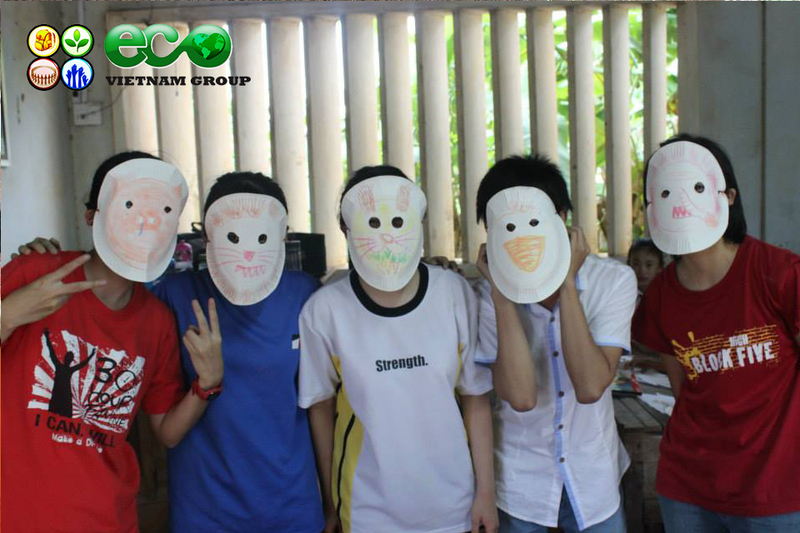 In the week from 27/5/2012 to 06/02/2013 , OUR DOOR project by ECO Vietnam Group ( EVG ) collaborated with the Paya Lebar Methodist Girls School , Singapore took place in Phuong Thinh commune , Cao Lanh district , Dong Thap province , OUR DOOR is a project aimed at helping and improving the lives of local people in Phuong Thinh . In just 7 short days, nearly 70 volunteers actively perform many diverse activities such as teaching , building toilets , flagstone paths , visiting the poor , cultural night organized cultural exchange By the his enthusiasm , the volunteers have brought joy to the children and partly to share the difficulties of the people here through practical work . Another interesting point of the project is English class of volunteers . The class attracted the local students . With lively teaching methods and friendly , the classes were enthusiastic children . The teaching session was short but had laid many beautiful feelings between the volunteers and the children , the tears of parting day linger . 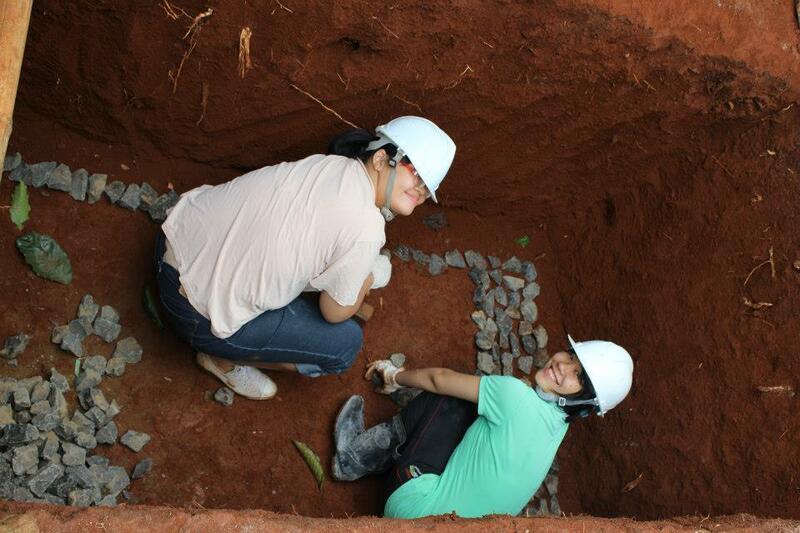 Also in OUR DOOR this project, the volunteers were spread over 1km stone for the children’s travelling to school easier during the rainy season. Understanding the significance of this activity, the militia he, locals have tools to help support the volunteers performed better job. In addition, the enthusiastic volunteers also participate in building toilets for poor households in the commune Phuong Thinh. Although inexperienced but mentally rolling his discharge was helping girls overcome the Methodist PayaLebar initial surprise and complete 1 toilet last working day at Thinh Phuong. Saying goodbye, what remains on the shoulders of volunteers no longer just a backpack, but it is the crystallization beautiful, valuable lessons come from the journey Phuong Thinh, friendship and memories of their will not be forgotten. 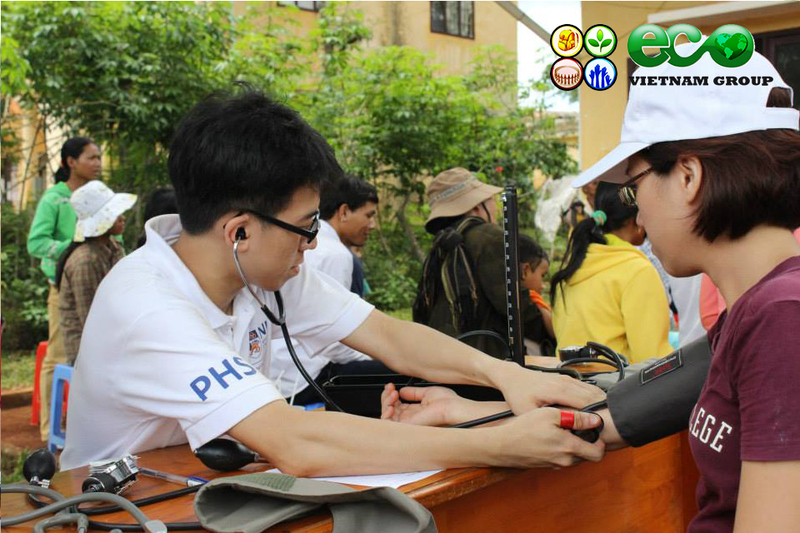 – 750 villagers receive the treatment from doctors, pharmacists and medical students. 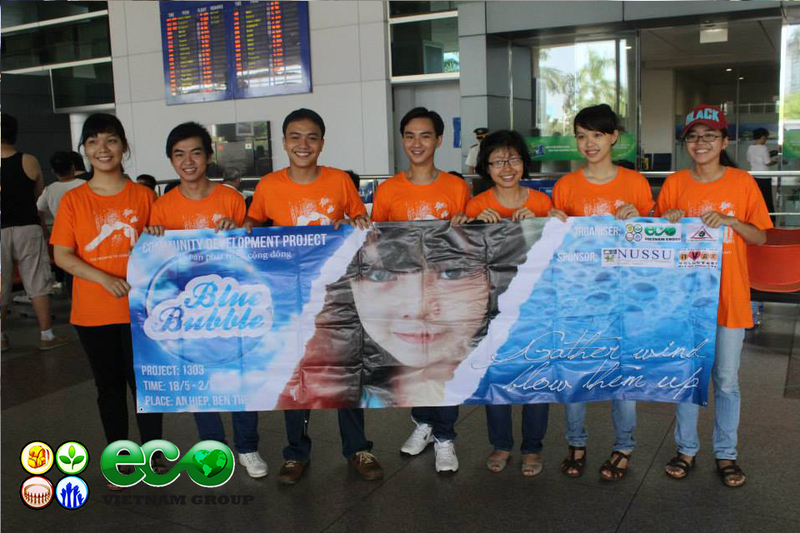 From 23.05.2013 until 06.01.2013 , GREEN CLINIC project by ECO Vietnam Group ( EVG ) in collaboration with Team Operation Medicine from NUS Yong Loo Yin School of Medicine , Singapore took place in an atmosphere rich warmth of love and compassion . Held in Gia Bac , Di Linh district , Lam Dong province is a project to help improve the health and life of the local people here . In just 5 short days , the spirit of youthful enthusiasm and thirst for building , community development , 16 volunteers ( volunteers ) come from Vietnam and Singapore with the support of six Vietnamese doctors South , they have done a lot of work meaning for people ‘s lives Gia Bac . These include the typical activities in this project such as stations and dispensing free medical examination , carried out a home visit to each household as well as advocacy survey and measure blood pressure check and people visiting households poor . Right from the first moment arrived in Ho Chi Minh City , the volunteers were quickly carried out the purchase of medicines and medical supplies needed to prepare for the examination in Gia Bac station . In the first day at Gia Bac , the volunteers and doctors have started right away with examination work at the station and found free medicines to the people . Only 3 exams , but more than 760 people had blood pressure measured , examined and medicines , in the laudable efforts of the group . This is an opportunity for volunteers to be close to the original people , to understand , to create sympathy where people and create more favorable conditions in the later survey date . End the job search at the station, the volunteers conducted Vietnam and Singapore trips to visit each household living in 5 villages and advocacy, guidance, sending information leaflets on health care and proper hygiene. At the same time blood pressure measured every survey people and get information, bandaged the wound healing skin if any. Besides, the volunteers also visited the households in disadvantaged areas. The trip was not only small help bring physical and spiritual families, but it also makes each of you have the opportunity to volunteer and learn more close to Gia Bac. 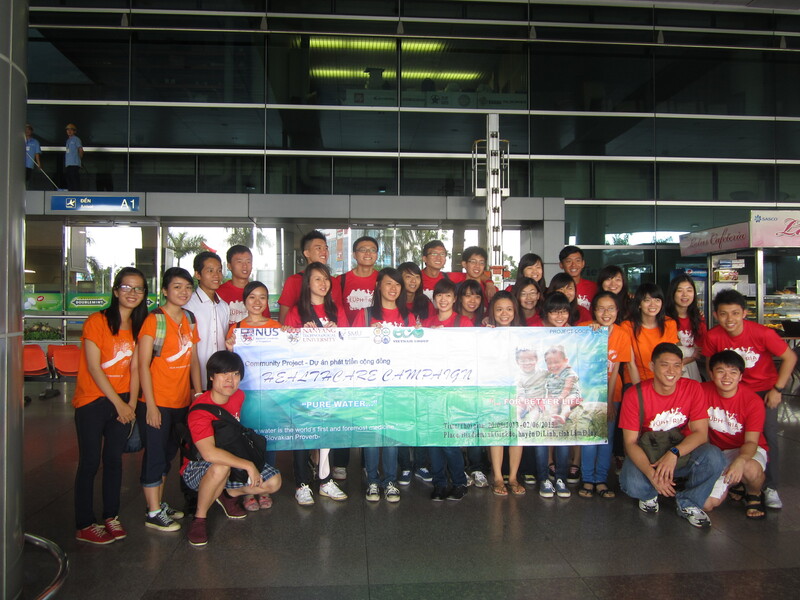 Project Healthcare Campaign was a cooperation project between EVG and the two high schools: SMU and NTU Singapore. Within 10 days at Gia Bac public library, 22 Singaporean volunteers and 4 Vietnamese volunteers contributed greatly to the community here, helping improve the living standard of the locals, especially health problem. 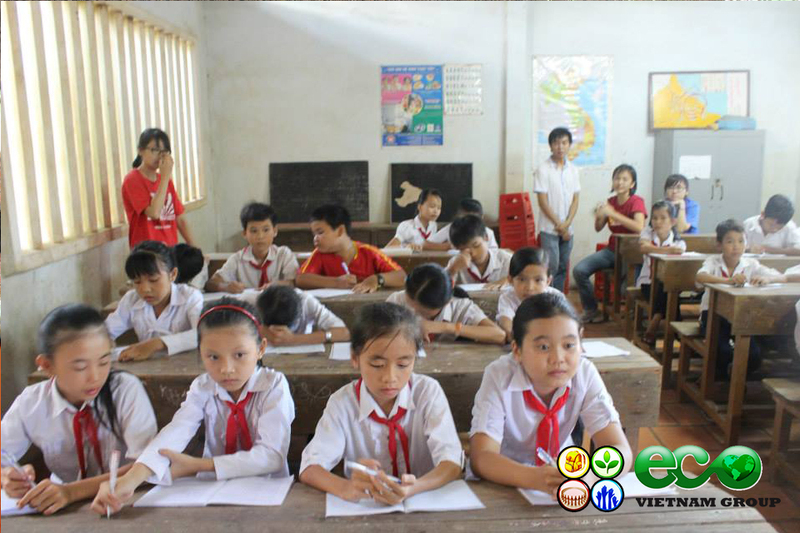 As for teaching task, the volunteers already taught 2 classes at Gia Bac primary schools: 5A1 and 5A2. We successfully organized a cultural exchange night in the presence of more than 100 students along with teachers and local authority. Leaving Gia Bac after 10 days, what still remained was wonderful memories they would never forget. Returning to HCM city, they had a chance to relax and visit many tourist attractions such as: Ben Thanh market, War Remnants museum, the tunnels of Cu Chi. They said goodbye to Vietnam on one rainy day. Healthcare campaign came to an end with many beautiful memories, with the friendships had just formed. But the journey to help Gia Bac was still on its way. We are young, free and enthusiastic, we still keep on going and grow up. We hope to see each other again, at Gia Bac, on one sunny day.